RIO DE JANEIRO — The conditions around the public health clinic in the vast slum of Jacarezinho are precisely what most Brazilian doctors prefer to avoid: dealers of crack cocaine ply their trade along dilapidated train tracks, and the odor from a crematory for stray dogs overwhelms patients and medical workers. “Of course I knew this mission wouldn’t be easy,” said Idarmis González, 45, one of the more than 4,500 Cuban doctors the Brazilian government is hiring to work in far-flung villages in the Amazon and slums in major cities. “We go where other doctors do not,” said Ms. González as she examined an infant suffering from dehydration and diarrhea. Faced with a wave of street protests in 2013 over deplorable public services, President Dilma Rousseff has made the hiring of Cuban doctors a cornerstone of her response to the turmoil, overriding the resistance of doctors’ unions to sending the Cubans, trained in a Communist country that says it has a surplus of doctors, into neglected parts of Brazil’s public health system. But the project also points to a broader ambition of Brazil’s government, which is vying to exert influence in Cuba as the authorities in Havana slowly expose the island nation’s economy to market forces. Brazilian exports to Cuba are surging, quadrupling over the past decade to more than $450 million a year. The inroads made by Brazilian companies in Cuba, relying on loans from Brazil’s national development bank and aid projects that share Brazil’s expertise in tropical agriculture, reflect a sophisticated projection of soft power in a country where Washington’s influence remains negligible. “This is Brazil playing the long strategic game in the Caribbean,” said Julia E. Sweig, director for Latin American studies at the Council on Foreign Relations. Cuba benefits, too. Its medical diplomacy, established decades ago with the export of doctors to developing countries, is reaping a major dividend with Brazil’s new project, worth as much as $270 million a year to Cuba’s government. The medical alliance bolsters ties between the countries, a prospect that Brazilian leaders have been vigorously cultivating since the 1990s. For Brazil, the payoff is obvious: It now ranks among Cuba’s largest trading partners, behind Venezuela and China. For Venezuela, Cuba’s top ally and the supplier of about 100,000 barrels a day of subsidized oil, ideology forms the basis for stronger ties; for Brazil the relationship is more about finding opportunities for Brazilian companies. For instance, a Brazilian soap opera produced by the Globo network, “Avenida Brasil,” now appears on Cuban state television, offering viewers a taste of life in Rio de Janeiro’s gritty suburbs. Building on Brazilian assistance programs to lift Cuban farm yields, Brazilian soybean and rice farmers are also emerging as top suppliers of food to Cuba. But Brazil’s top project in Cuba is the $900 million upgrade of the Port of Mariel by the construction giant Odebrecht, the same company that has carried out various infrastructure projects in South Florida. While Washington’s prolonged economic sanctions prevent most American companies from doing business with Cuba, Brazil’s efforts to gain a foothold in Cuba come at a time when the island’s economic relations are in a state of flux. Venezuela remains Cuba’s top benefactor, but it is unclear whether Venezuela can sustain such largess as it confronts economic troubles of its own. Venezuela and Cuba recently delayed a $700 million nickel venture, and talk of other cooperation projects has died down. At the same time, Chinese exports to Cuba have climbed sharply. Chinese tourist buses can be seen outside big hotels, Chinese-built Geely cars have become de rigueur for Cuban officials and thousands of students studying the Spanish language fill hostels and Havana’s tiny strip of Chinese-Cuban restaurants. Brazil’s profile within Cuba remains far more subtle, but the arrival of thousands of Cuban doctors, many of whom are black, has made a big splash here, shaking Brazil’s medical establishment and revealing some painful tensions over race and privilege. “These doctors from Cuba are slave doctors,” said Wellington Galvão, director of the physicians union of Alagoas in northeast Brazil, repeating an assessment of the project by critics who contend that the conditions faced by the Cubans in Brazil are degrading. 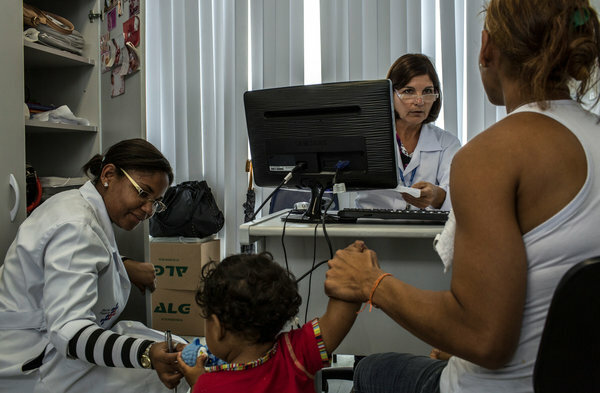 Under terms of the program, which is managed in part by the Pan American Health Organization, the Cubans are not allowed to bring their families to Brazil and receive only a fraction of their monthly salary of about $4,255. The rest is paid to Cuba’s government, providing it with a new source of hard currency. Supporters of the project in Brazil retort that the description of the Cuban doctors as slaves is a sign of thinly veiled racism and class bias among the medical establishment. Ms. Rousseff herself has lashed out at what she called “prejudice” against the Cubans. Brazil ranks well below neighboring Argentina and Uruguay with just 1.8 doctors per 1,000 people, according to the World Bank, so hiring the Cubans could be seen as a savvy political move by Ms. Rousseff, who is running for re-election next year. “I’m just happy to have a doctor, period, whether he’s Cuban or not,” said Sthefani Nogueira, 21, after a gynecological exam at a public clinic in the Rio neighborhood of Realengo, performed by Israel Fernández, 47, a Cuban doctor who arrived here in October. With the project in its infancy, pitfalls could still emerge. After Venezuela began hiring Cuban doctors in 2003, hundreds of them fled their posts to request asylum in the United States. In Brazil, Latin America’s largest democracy, confusion has persisted over whether the Cuban doctors arriving here will be able to request political asylum. A spokeswoman for the Justice Ministry said that the Cubans would be able to request refugee status if they said that they were being persecuted for their political beliefs, though she said none had taken that step in 2013. Brazil’s efforts to deepen ties with Cuba have encountered other problems. Dealing a blow to Cuba’s ambitions of increasing oil production, the Brazilian oil company Petrobras halted an offshore exploration operation in Cuban waters after drilling produced disappointing results. And Odebrecht, the Brazilian construction giant, has had to wage legal battles with some Cuban-Americans in Florida over its activities in Cuba. But the doctors who return to Cuba from Brazil may carry with them the seeds of new perspectives after witnessing Brazil’s efforts to respond to the recent street protests and other forms of political dissent. “Brazil is a model for Cuba in that it has managed to develop its economy with peace and consensus,” said Roberto Veiga, the editor of a Cuban magazine funded by the German Bishops’ Conference.